Sterling Silver 925 Victorian Leaf Filigree Vintage Style Ring Size 11. Our silver jewelry is made from Sterling Silver. Sterling Silver is a mixture of high-quality 92.5% or higher pure silver with alloys to add strength and ability to withstand time and wear. All our items have a 925 Stamp referring to the Silver Purity that was used when crafted. Please Note: The 925 Stamp location may vary, depends on the item. VICTORIAN LEAF FILIGREE RING: Symbolizing the delicate nature of women, this beautiful vintage ring influenced by Victorian Leaf is shaped in the form of stylish and elegant filigree. VINTAGE STYLE RING: This ring is designed in such an elegant way that it brings back the old days of the vintage Victorian ring, would be a great addition to your ornament collections. 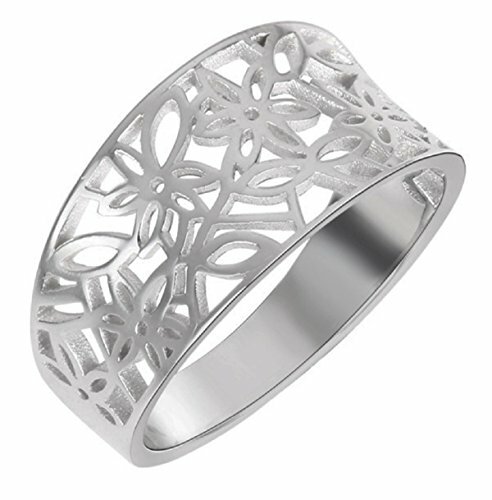 INTRICATELY DESIGNED: Craftsmanship at its best, with the leaf lattice of the ring's body designed intricately. MADE OF REAL STERLING SILVER 925: This Victorian Leaf Ring is made of sterling silver 925, which is composed of 92.5% silver. This composition make this ring extremely tough making it suitable for everyday us. RING SPECIFICATIONS: Sizes - Available from 3 to 15, Colors - Available in Silver, Rose Gold-Tone Plated & Yellow Gold-Tone Plated (see links below). Gift wrapped in either cotton filled box, velvet or organza gift bag.